Our company develops supreme range of Industrial Storage Systems that is widely installed in chemical industry, dairy industry, pharmaceutical industry and petrochemical industry. These Industrial Storage Systems are constructed from high grade stainless steel that gives robustness and adds to the functional life of the system. 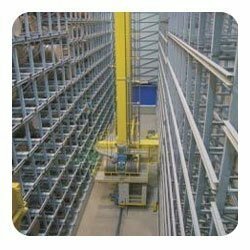 We offer Pallet Racking Services. Pallets are loaded on rollers sloping towards the pick face. When you remove a pallet, gravity and an automatic braking system bring the pallets stacked behind it to the front of the rack at a controlled pace, so your picking face is always full. We are looking maximum queries from South India. Made of hard wood. Wall mounting type l .
capacity: 12 burettes of 50ml each. Burettes can be vertically positioned. 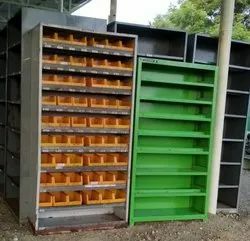 Provided in beautiful appearance, reasonable structure, solid and manageable structure, these storage systems are very durable and strong in construction. We are a trusted name engaged in manufacturing & supplying precision engineered. Our pallet racks is attributed for durability, long service life, easy to operate and easy to maintain. In addition, we offer tailor made solution for installation of pallet racks in respect of volume, size and type of material storage. We present to our clients, a high performing range of storage systems that is provided with wheels for assuring mobility and high efficiency. We manufacture pallets from high quality steel. These are suitable for handling pharmaceutical products as well as food grade products. The materials are generally stored in boxes and bags. As a result of placing these boxes and bags in pallets, the contents settle uniformly on the pallet. Our pallets are made available to clients in sizes and shapes of their choice.